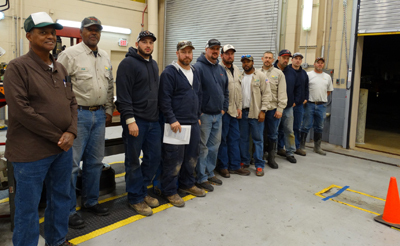 Crews from Southern Maryland Electric Cooperative traveled to Front Royal, VA, recently to help Rappahannock Electric Cooperative with a massive Power Restoration effort, bringing service to thousands of co-op members after ice and snow left them without power. 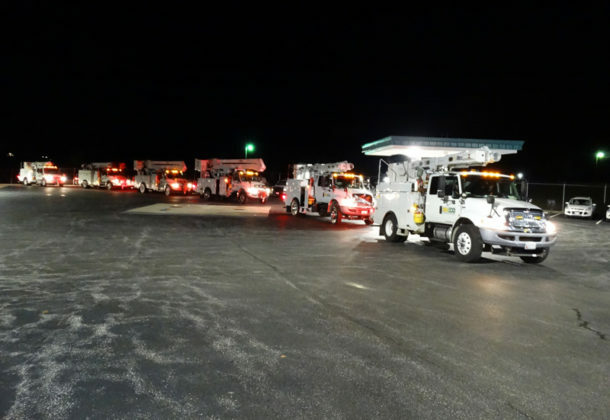 SMECO crews assemble before leaving Hughesville to assist Rappahannock Electric Cooperative on Nov. 16, 2018. 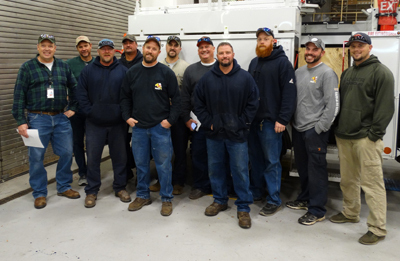 “Our SMECO crews know how important it is to provide assistance to our sister co-ops because sometimes linemen are the only ones who can do the job. They take on the responsibility of making sure customers get their lights back on, whether they are SMECO members or members of another co-op,” said Austin J. Slater Jr., SMECO president and CEO, in a news release. SMECO sent 22 workers, which included two six-member construction crews, two bucket trucks, a digger derrick, and a pick-up truck; four service crews with two members each, each with a bucket truck; plus two supervisors. The crews left Hughesville at 6 pm Friday, Nov. 16. Casey Hollins is the director of communications and public relations at REC. Ms. Hollins said the ice and snow had fallen during the night Wednesday and into Thursday, causing trees and limbs to fall and damage power lines. The crew members who went to Virginia included, in alphabetical order, Robbie Abell, Steve Cook, Scott Cox, Stephen Crim, Chris Drury, Brent Garner, Josh Gragan, Wayne Gray, Steve Guy, Brent Hancock, Jimmy Herbert, Daniel Hutchins, John Meade, Kila Mills, Jason Murray, Dennis Norris, Zach Reynolds, Will Robertson, Tim Russell, Kenny Sebring, Philip Swales, and Chris Swann. Follow SMECO on Facebook at and on Twitter. Get the SMECO 24/7 mobile app.